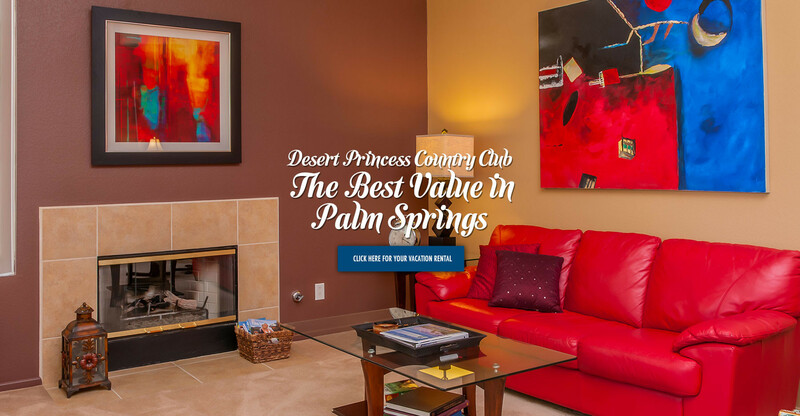 The Palm Springs vacation rentals at the Desert Princess Collection sit directly on an exquisite 27 hole championship golf course designed by David Rainville, located just minutes from beautiful downtown Palm Springs California. Your very own Palm Springs vacation rentals home await you! The Country Club Collection provides 10 unique vacation rentals that feature all the amenities of a top quality resort hotel suite, but at a fraction of the cost. Enjoy breathtaking mountain views, cool soothing waterfalls, brilliant blooming flowers, crisp clear swimming pools, and acres of lush green rolling fairways. This and so much more awaits you upon your arrival at your private vacation retreat at the Desert Princess Country Club. These charming Palm Springs vacation rentals provide you with privacy as well as community. 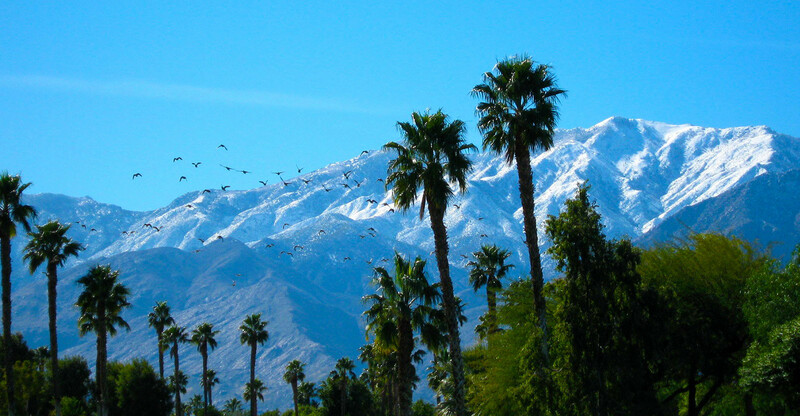 Our vacation rental homes are located in Cathedral City and are within arms reach of multiple beautiful desert cities including, Palm Springs, Palm Desert, Indian Wells, La Quinta, and Rancho Mirage. These warm and intimate vacation condos and villas are all single story and located on the golf course with expansive views. Our 2 bedroom vacation rentals sleep up to 4 guests, while our 3 bedroom rentals sleep up to 6 guests. Other features that will enhance your stay include fully furnished kitchens, DVD/CD players, bedroom TVs, skylights, washer/dryers, dishwashers, gas grills, double sinks in the master bath, and stacks of good books, CDs and movies. Many units also have fireplaces. 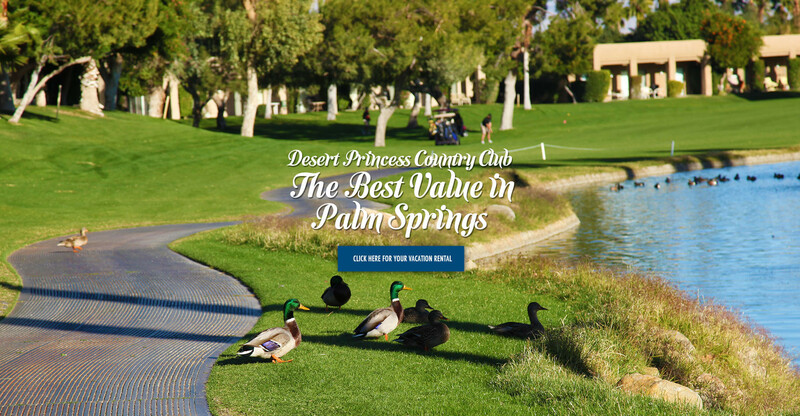 Guests at Desert Princess Country Club have access to the club’s 27-hole championship golf courses (PGA rated), a fully stocked pro shop, driving range, 2 putting greens, and clubhouse with a dining room and bar featuring Happy Hour. The tennis clubhouse overlooks 10 tournament style tennis courts, including 8 lighted courts, and 33 sparkling pools and Jacuzzis are sprinkled throughout the resort, including one overlooking the golf course that lies no more than 20 yards away. Guests are also invited to visit the Spa and Fitness Center. The Desert Princess Resort Hotel, with additional restaurants and bars, is also located on the grounds of the Country Club. We invite you to come stay with us at the Desert Princess Collection Palm Springs vacation rentals, we are sure you will enjoy every minute of your stay. See you soon!